Music Notes For A Few Oldies Pop Songs, Suitable for tin whistle, recorder, piano keyboard flute and banjo / mandolin.This is a simple form of music and is ideal for people who don't read sheet music. I have given the key for most. The key of D would have two sharps and the key of G has one. The key of C has no sharps or flats. If playing a whistle in the key of D then the F note is already a sharp # note anyway. Most of these were set for a tin whistle and are nearly all in the key of D or G. So generally when you see an F / f note you'll know it's sharp. 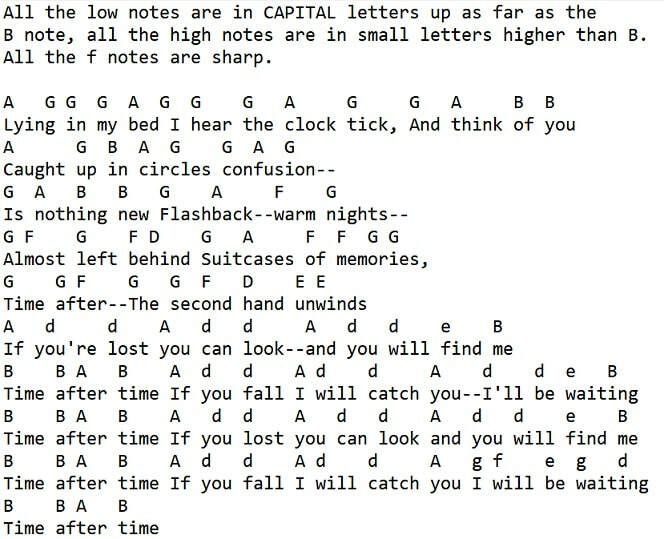 All the notes in CAPITAL letters are the one's up to the middle B and all the notes in lower case letters are the high notes past B. This goes for all music instruments. There's A Kind Of Hush - The Carpenters and Herman's Hermits. Some of the c notes in this song are natural and some are sharp. Be careful. Key of D Major. All the F / f are sharp and the c notes. Boolavogue, Irish rebel song piano keyboard notes. For Ireland's freedom we fight or die." Says I "A quick pint wouldn't do me no harm. Childhood dreams and youth's ambition, have all turned to doubts and fears. As I recall old Dublin in my tears. Now Jack was a sailor who roamed on the town. And she was a damsel who walked up and down. Fol de diddle rye raddy rye raddy rye. Sure, the story I tell you is true. in the County of Armagh. Way hey, you roll-ing river. Ha ha, we're bound away 'cross the wide Missouri. Led by Kelly the boy from Killane. The verses of this song are straight forward with all the F and C notes being sharp. In the chorus there's a couple of E # notes and you should half close that E note. It's the place of a thou-sand thrills. Home means Ne-va-da to me.